Name your price (0.00 and up) -- 25.00 is suggested. Price is in USD. Included are 128 patches, both A and B user banks, to take your JP into the 21st century. This vintage monster is still quite capable of very modern sounds. I tried to show off everything this amazing VA can do apart from only supersaws. It has some monster FM capabilities in addition to beautiful filters and snappy envelopes. But, fear not, I intend for my bank to be all you need for your JP, so I've also included some classic sounds like massive supersaws and plucks. Note that some external FX where used in the audio demo, some EQ and mix compression. 128 patches of analog heaven for your Dave Smith Instruments Prophet '08 analog synthesizer. Sounds from popular Anjunabeats and Armada releases. Will work on a DSI Tetra or Mopho without alteration. NOTE: If you have issues loading this bank, try loading the MID or SYX directly instead of through the SoundTower editor. 128 patches for your Access Virus TI, TI2, or TI Snow synthesizer. This bank is unlike anything ever released for the Access Virus as it is the first patch bank to feature the sounds of Anjunabeats, Armada, etc. These patches WILL work with the Virus A/B/C/PowerCore/TDM (TI only features like Wavetables will not load). The standard patch bank has no settings for delay / reverb / EQ. Included is a patch bank containing the exact patches I used for the audio demo, with FX. The Nord Lead 2 differs quite a bit from the Nord Lead 3. It has a slighty edgier and punchier sound, fatter OSCs, and more aggressive filters. However, it lacks the Nord Lead 3's extensive modulation capabilities, dedicated sync for each OSC, and variable unison. It's give and take, but the Nord Lead 2 and 2X prove to be quite up to the challenge and can make their own space in a studio that has even both a Nord Lead 2 and Nord Lead 3. Patches 1-25 are Bass, 26-74 are Leads, 75-89 are Pads, and 90-99 are Plucks. This bank does not contain percussion patches. This bank will work with Disco DSP Discovery, but it was not designed to. Use this bank on Discovery at your own risk. An FXB format file is included. The Nord Lead 2 only has space for 40 user patches. To enjoy all 100 patches, the Nord Lead 2 requires a storage card. The Nord Lead 2X has space for all 100 patches without needing a seperate storage card. External reverb, EQ, delay, and mix compression where used while producing the audio demo. A full 128 patch bank for your Clavia Nord Lead 3. Sounds based off of releases from artists such as Sean Tyas, Filo & Peri, Above & Beyond, Andy Moor, and many many more. If you are fortunate enough to own one of these analog monsters, today is certainly a lucky one. 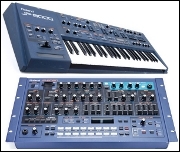 A first of its kind release for the Alesis Andromeda A6. 128 trance-oriented patches ready to take your Andromeda where few dare to bring. Who says there such thing as too much adrenaline? Note that some external VST effects were used in the audio demos. The bank itself does not utilize the Andromeda's effects at all except for the analog distortion unit. All Synthesizer Patch Banks © 2019 Alan Marcero. Content of the audio demos is copyright their respective owners.